My favourite pad for embossing! This is a full sized 3" x 3" clear embossing pad for use with heat embossing powders, mica powders and to creat lovely watermark effects! 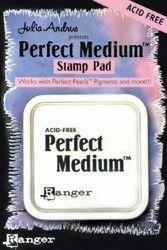 Simply 'ink' your chosen stamp up with the perfect medium, add embossing powder and heat with your heat tool. Or, 'ink' you stamp up with the perfect medium pad and gently dust mica powders on the stamped image to create stunning, pearlescent effects!